Tapan, an autorickshaw driver who has lived in Bangladesh his entire life, still drinks jol. Hamid, the friend seated next to him, drinks paani. They are engaged in friendly banter, debating which is sweeter, jol or paani. Till realization strikes. Jol is paani, paani is jol. Jol is the word for water commonly used by the Hindu minority in Bangladesh, whereas Muslims use the word paani, even though Bengali is the shared language for both communities. Most times, the friends drink from a common water source, the village tubewell. What started it was my mentioning jol. I was immediately identified. “From India, dada?" It was no longer possible to disappear behind the common colour of skin, language and physicality shared by people crudely separated in 1947 along Radcliffe Line. A fascinating exchange ensued for the rest of our journey between Tapan, the Hindu-Bangladeshi from Jessore district bordering West Bengal, where the term jol is still used, and Hamid, the Muslim-Bangladeshi from Chittagong district. This happened days before my Bangladeshi visa was to expire—a couple of months before Prime Minister Manmohan Singh’s visit to the country last week, when a historic agreement was signed on the demarcation of the boundary between the two countries, which resolved the status of 162 adversely held enclaves of Indians in Bangladesh and Bangladeshis living in India. Over the month that I was in the country, the two Banglas, Bangladesh and West Bengal, had seemed to segue into one. Never mind the fencing at the border, concurred the well-known Bangladeshi artist Mahbubur Rahman at a farewell party hosted by film-maker and photographer Molla Sagor. Sagor also edits the absorbing cross-cultural Bengali website Shapludu.com, where film-maker Ritwik Ghatak and singer-songwriter and politician Kabir Suman from Bengal share Web space with the likes of film director Tareque Masud and poet Jasimuddin of Bangladesh—a cyber residence for people who have kept their art out of the narrow alleys of the parochial and communal. I reached out for jol to dilute my drink. And I got paani in return. “I want to organize an art show at the Bangladesh-Bengal border," Mahbubur continued, while his artist wife Tayeba Begum Lipi nodded. It was not mere alcohol-speak. Mahbubur repeated this a week later at the Akar Prakar gallery in Kolkata during a get-together to celebrate his receiving an award from a Kolkata-based TV channel. “Let artists from both Banglas assemble in front of the border fence and interact over art," the artist added with conviction. Lipi nodded again. Masudur Rahman, a fine arts graduate from Charukala—the hallowed art institute established in 1948 with the renowned artist Zainul Abedin as principal, which has been at the forefront of Bangladesh’s art movement—has a different take on the border. He fears a day might come when practising art will be deemed immoral by fundamentalists and Masudur will have to cross the border and settle down in Kolkata. At our first meeting at Imon’s tea stall opposite Charukala, where young intellectuals in Dhaka exchange ideas of dissent over cups of black tea, Masudur had shared his sense of dread. His Bangladesh is clearly in danger—the collapse of healthcare, mindless consumerism, widening income disparities, and above all, the rise of Islamic fundamentalism. For Masudur, all these are a negation of the original spirit of a country founded on the basis of the Bengali language, culture and secular pluralism. Some years back, Masudur, along with friends from the Charukala Institute and University of Dhaka, fiercely resisted the right-wing forces of change, even indulging in street skirmishes around the sprawling university area. Masudur’s wife Ishrat Zahan (popularly known as Kakon), a painter and singer, recounts the adrenalin rush on seeing a police vehicle go up in flames on a Dhaka road. When we first met, Masudur and Kakon, who met as students of Charukala, had extended the kind of hospitality that defies reciprocation, sparing their bed for the “mehmaan (guest) from India", sharing their food. Kakon sang gloriously and deep into the night, Masudur read out his poetry. Nearing dawn, Masudur spread his recent paintings on the floor—works reflecting his fear and rage, metaphors of society’s mutilation and transmutation amid the flamboyance of colours and symmetry. 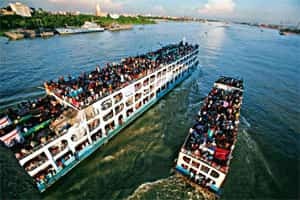 But I wasn’t there to visit Dhaka, with its mind-numbing traffic snarls, the army of rickshaws flaunting graphic hand-painted kitsch art, glass and granite skyscrapers, Japanese sedans, Korean restaurants, streetside kebab stalls, admirable public art installations, conformist mores and Islamic hospitals. I was in the country to spend a month in a land where my maternal roots run deep. I was there to unravel the simplicity of my maternal grandmother’s (Sarojubala Mukherjee; dida to her grandchildren) past in the river-veined district of Barisal. 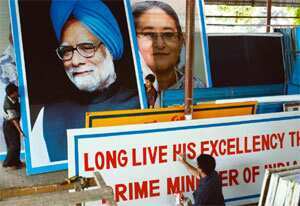 Workers putting finishing touches to Prime Ministers Manmohan Singh’s and Sheikh Hasina’s posters earlier this month. This measure of magnanimity ensured that everyone was welcome, barring thieves, though they too occasionally paid a predawn visit. These unwanted visits would often be materialistically futile, for mamar bari would invariably be teeming with guests—near and distant relatives, friends of relatives and relatives of friends forming a constant stream of visitors from Bangladesh, Assam and Bengal. None left without food and a good night’s sleep at a home that, with its L-shaped construction, tulsi plant circled by a courtyard, jackfruit and mango trees, nearly approximated dida’s village house in Barisal. Indeed, to dida, like so many others of her generation, 1947 would always be remembered as the year of “desh bhaag" (Partition) rather than the year India won its freedom. Months before my visit, most people in Kolkata would open up with an “Ah, Bangladesh!" when they heard of my plans. Ah, Bangladesh—how much emotion has been invested in that utterance. I could somewhat fathom the entire range of sentiments attached: the longing for a land—bhitye—that has been permanently lost, yet which is remembered through a prism of love. Loss, longing, love. Take, for instance, the story of an old lady displaced by Partition, recounted to me by documentary film-maker Sudeb Sinha. Even 50 years after she arrived in Kolkata as a refugee, and right till her death, the lady refused to participate in the city’s Durga Puja celebrations—Durga, she would reiterate, got left behind in her village in Bangladesh’s Khulna. For Avik Bandyopadhyay, the poet, Barisal was remembered through the memory of another poet, Jibanananda Das, who sought answers to life’s complexities from the abundance of nature in Barisal. In Kolkata, Sumeru Mukhopadhyay, film editor, writer and friend, hurriedly completed his representative painting of Bangladesh for me to see—a shining hilsa fish on a straw mat-like background in red and yellow. He is a foodie too, of course. The hilsa would come up again. Radharani Mukherjee, my mother’s 85-year-old aunt, with roots in Barisal, recalled how her brother was slaughtered in the post-Partition riots. She lightened up at the mention of the fish. “Along roadside bazaars, the silver of the fish would stun the eyes. There was abundance. The cats would get a few pieces too." Minutes before our early-morning Volvo bus left for Dhaka, Arup Roychowdhuri, an IT professional with whom I have spent many invigorating evenings, dropped in at the Salt Lake bus stand carrying a photocopied version of Jibanananda Das’ novel, Karubasona. The bus moved along Jessore Road—a road lined by old arching trees, sentinels from the time millions took the road to flee the communal fires of East Pakistan. For many of my generation, the traumatic past of Jessore Road came alive through singer Moushumi Bhowmik’s heart-rending rendition of a song inspired by Allen Ginsberg’s poem, September on Jessore Road. It was as if I was carrying the load of loss, longing and love of a people who could not return, but only covet. A week later, I was on my way to dida’s Barisal. Parabat 9, the three-storeyed launch, was packed. Masudur and Kakon had come along. Masudur was returning to his hometown after many years. He yearned for the Barisal of his childhood, when he would go fishing on the Kirtonkhola river with friends, spending nights on swaying country boats. The Kirtonkhola is there, but most of his friends have left, certainly most of his Hindu friends. As Parabat 9 got ready to leave Dhaka, from my earphone rang out Bangladeshi singer Ornob’s placid voice: “Ekta Banglabhenge adhkhana acche/Adhkhana swaad niye adhpeta baache (only half exist of a Bangla divided/On half a wish is life half lived)." As the launch left the Buriganga river and headed towards the mighty Meghna, Masudur looked expectant. We stood on the upper deck as the vessel hit the rolling Meghna waters. In the dark, distance were flecks of light from fishing boats. The breeze carried with it the gentle brush of a drizzle and hints of a popular Lata Mangeshkar Bengali tune. Somebody in the launch was playing the song on his mobile phone. Kakon sung the missing parts when the breeze carried the tune elsewhere. I kept my eyes fixed on the jol, Masudur on the paani. Jol is paani, paani is jol. And everything seemed fine.